We understand that you have multiple projects with multiple contractors/freelancers who come and go on ad hoc or specific term basis. Their data doesn’t sit right in your employed team HR records, but you need to be sure that all your projects who hold data that is current, relevant and up-to-date. 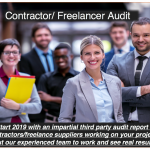 Things change for contractors and freelancers more often than for your employed personnel, the big questions is it being tracked and verified? 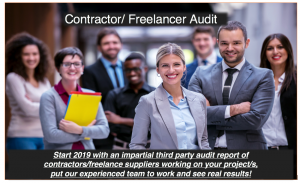 Vaultproof is offering documented audit options giving you verified data that is GDPR compliant and will give you a clear picture of how your contractors and freelancers are supporting or draining your project resources. Procurement/Recruitment/Contracts including data compliance/Insurance/Policies and Resource Usage [optional]/Revenue Compliance/Qualifications/License’s/Activity/Evaluation/Feedback Data. This list is not exhaustive. Financial feedback: we can add to the audit data how you are being charged and are paying out against the agreed contract/LoO/RFT/Q. Companies we work with find that this is where their budgets get into trouble and they can make the most savings and contract adjustments. How do we do this, we give you an agreed pro-forma document that you provide to your projects and one for all your contractors/freelancers. Confirmation of participation is collected into your own secure audit dashboard and we get to work validating and reporting on this information, individual by individual, project by project, site by site. Costs agreed on a case by case basis. On the work carried out to date, we have saved companies time and money and ensured full contract compliance across the board. For the majority of our clients to date, this cost has come in under-threshold.